Today I am participating in a blog swap. 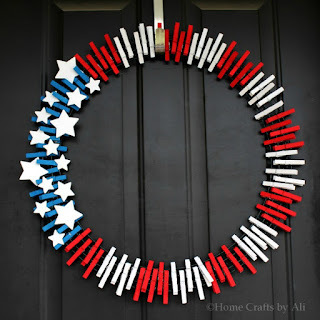 My friend Kim is posting here on my blog and sharing a fun kids craft post, and I am at her blog sharing a fun kids craft project. To see the glass votive holders that my girls painted, you can visit her page here. Now let me turn my blog over to Kim! Hi! I'm Kim visiting today from The Resourceful Mama. 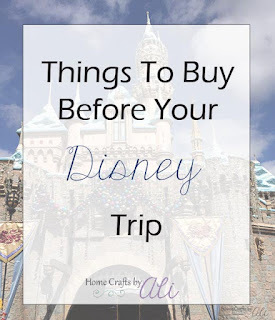 I am so excited to be visiting with you today on Home Crafts by Ali and sharing one our many craft projects with you. I am having a great summer with my three kids. We love everything about summer, including warm sunny days. We are having so much fun soaking up the sun this summer in our backyard, at the park, and at the pool. One of my favorite songs that I sang to my kids when they were babies was “You Are My Sunshine”. They are now old enough to realize that mom is a terrible singer and they shush me. I have found other ways to share my love with them, like this paper plate and mini clothespin sun. 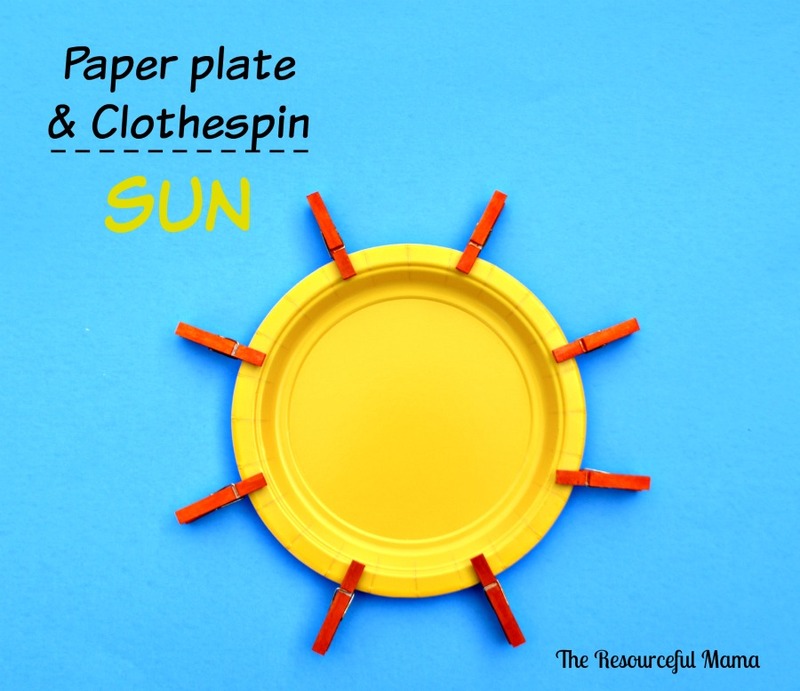 This sun craft project made from mini clothespins and small paper plates was so fun and easy to make. Have you seen these mini clothespins? They are the cutest things. They caught my eye as I was checking out at Hobby Lobby the other day. Craft stores are a dangerous place for me; kind of like shoe stores are for some. There’s so much fun stuff! Orange marker-I would suggest using a washable maker. These clothespins are small and kids are likely to get the marker on their hands. Small Yellow Plates -if you don’t have yellow, just use white and have the kids paint or color it yellow. 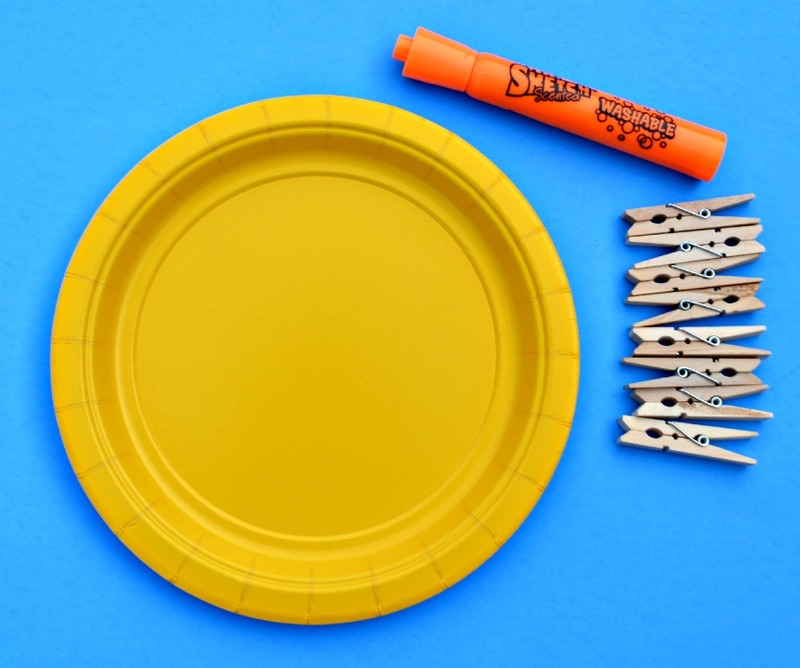 Color the mini clothespins with orange makers. You could also paint them with orange paint, but we found that markers worked best. If the mini clothespins are too small for your little ones to old while coloring, attach them to a piece of cardboard and have them hold onto the cardboard with one hand while coloring with the other. 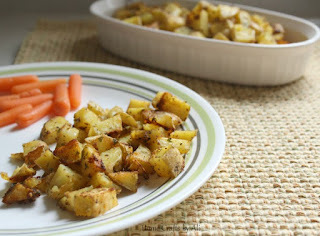 If you are using a white plate, paint or color it yellow. We clipped 8 orange clothespins around the plate to make the sun’s rays. You can use more or less. This is great craft project, because even your littlest ones can do it and opening clothespins is great for development of those fine motor skills in little ones. It's Ali here again. 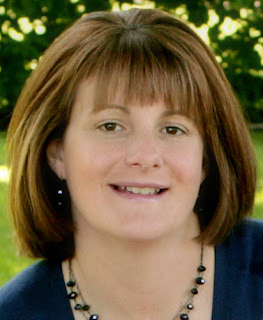 I want to thank Kim from The Resourceful Mama for sharing on my blog today and letting me visit her blog too. I hope you enjoyed her fun project for kids. Go look around her page for some other great crafts to work on. I love this Disney I Spy bag she created. I'm planning on making one before our road trip this weekend. Thanks for doing the swap Ali! It was a great idea! Have a good time this week! It was fun to swap Kim! This is awesome! We should team up sometime. We love fine motor activities that help our students with their handwriting and reading. The sensory rice bag is adorable as well. They will love this project for summer. I'll have to pin for later! 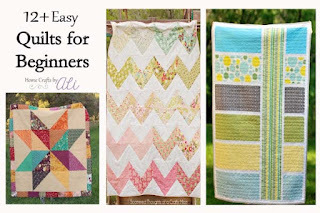 Kim has some great projects at her site that I think you would really love. A lot of them could be integrated into sensory play and learning. You should check out her site! I hope your kids like it Kendra! That's certainly a quick and easy craft that would be great for little hands and short attention spans. OK, this is weird. I tried to Stumble this for you and it said that they won't accept Stumbles from this site. Did you tick off the SU bigwigs or something? I've never seen it say that before. That is so strange Adrian! I've never Stumbled from my page, so I'm not sure. None of my content is inappropriate, so it's weird. I wonder how I can look into changing that?? Glad you liked it Sydney! Thanks for stopping by Heather. Glad you liked it! Thanks for you nice comments Colleen! Glad you liked it Brooke!